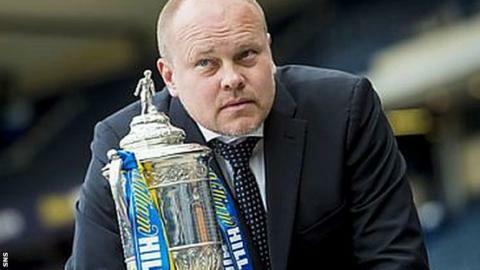 Mixu Paatelainen has urged his Dundee United players to give their suffering fans a Scottish Cup final as reward for enduring a "horrendous" season. United's 20-year run in the Scottish Premiership looks set to end with the club eight points adrift at the bottom. "We've had a horrendous season but our supporters have been brilliant, they really back the team," said the Finn. "But now Saturday is a chance to send the fans home happy after a painful season. Hopefully it's payback time." The former United striker took over in October with the club having won just one of their first nine league games under Jackie McNamara. But despite a modest recovery of late, with four wins and two draws from their last 11 Premiership matches, the writing is on the wall after Saturday's dismal home defeat by Inverness CT. But Paatelainen believes his side can still reach the end-of-season Hampden showpiece if they show the spirit that saw them beat Ross County in the quarter-finals from 2-1 down with 10 men. "We feel we have a chance," he said. "We also realise Hibs are a strong team. They have a squad fit for the Premier League and good options off the bench. "They have been here before this season [in the League Cup final] which I think plays a role, and is an advantage to them. But on our day I know our boys can do it. "There have been some great days for us when we have played really well so I know we can produce that, and that gives us confidence. "As coaches it us up to us to make sure the boys are ready energy-wise and mentality-wise and then it is down to them to be determined, brave, strong and positive. "Their attitude has been tremendous every week, always. The effort and application is there. "We're in a semi-final with a chance to go on and lift the trophy. This is a huge game and the league is totally out of our mind."